The Pyrophosphatase, inorganic (PPase) catalyzes the hydrolysis of inorganic pyrophosphate to two orthophosphates. The enzyme requires a divalent metal cation, with Mg2+ conferring the highest activity. E. coli cells with a cloned ppa gene of Sacharomyces cerevisiae. 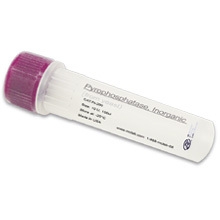 One unit is the amount of enzyme that will generate 1 µmol of phosphate per minute from inorganic pyrophosphate under standard reaction conditions (a 10 minute reaction at 25°C in 100 mM Tris-HCL, [pH 7.2], 2 mM MgCl2 and 2 mM PPi in a reaction volume of 0.5 ml). 1. Cooperman, B.S., The mechanism of action of yeast inorganic pyrophosphatase, Meth. Enzymol., 87, 526-548, 1982. 2. Cunningham, P.R. and Ofengand, J., Use of inorganic pyrophostase to improve the yield of in vitro transcription reactions catalyzed by T7 RNA polymerase, Biotechniques, 9, 713-714, 1990. 3. Tabor, S., Richardson, C.C., DNA sequence analysis with a modified bacteriophage T7 DNA polymerase. Effect of pyrophosphorolysis and metal ions, J. Biol. Chem., 265, 8322-8328, 1990. 4. 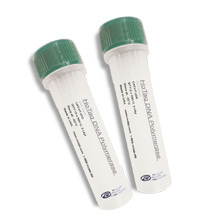 Dean, B.F., et al., Rapid amplification of plasmid and phage DNA using phi29 DNA polymerase and multiply-primed Rolling Circle amplification, Genome Res., 11, 1095-1099, 2001. 5. Zhou, G.H., et al., Quantitative detection of single nucleotide polymorphisms for a pooled sample by a bioluminometric assay coupled with modified primer extension reactions (BAMPER), Nucleic Acids Res., 29, E93, 2001.